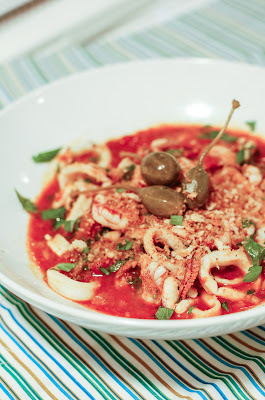 This recipe comes from Frank Bonanno's Luca D'Italia iCookbook. 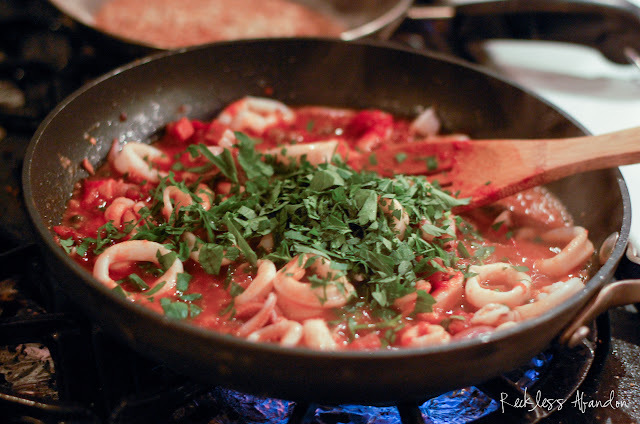 The restaurant has been a local Italian favorite in Denver for years, so Frank picked his favorite recipes for the home cook and added pictures and videos to the interactive cookbook. 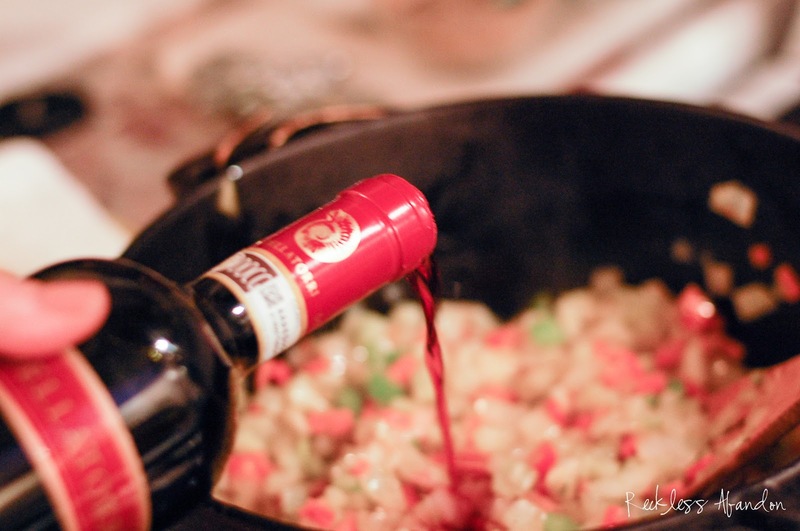 I was recently invited to the restaurant with a few other food bloggers to taste some of the recipes and this was a favorite. It starts by making the "Mother Sauce", a wonderful red sauce simmered with a full bottle of chianti wine...yes please. 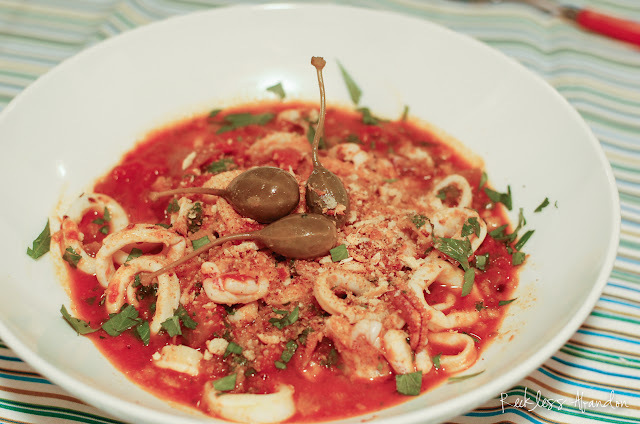 The sauce has unlimited uses but here it is ladled on top of calamari rings with capers and toasted bread crumbs. 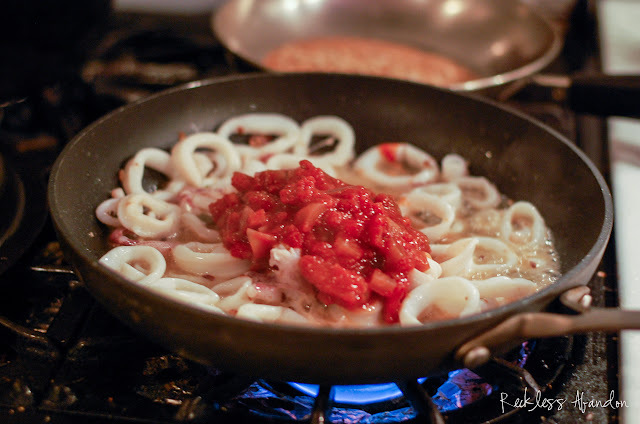 Much fancier than your fried calamari. 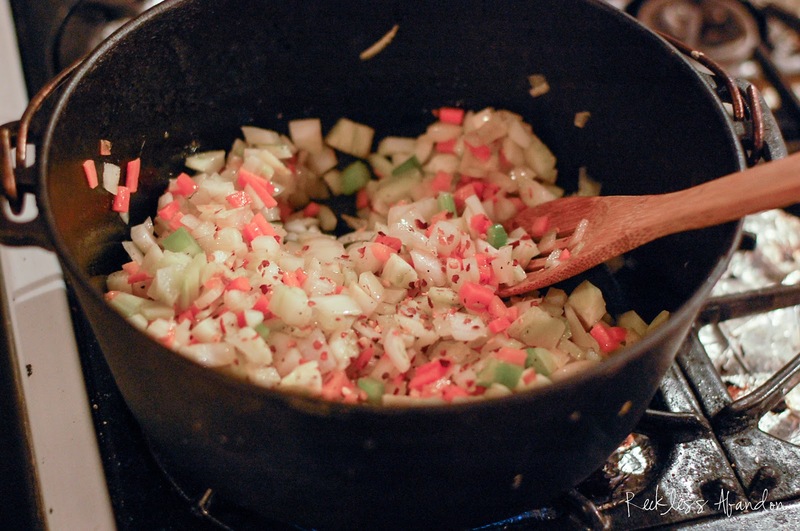 First, make the Mother Sauce. 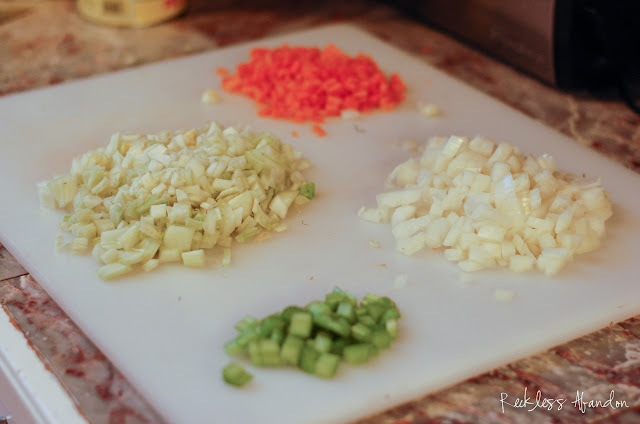 Dice your vegetables (onion, celery, carrots, and fennel) into a small dice (Frank has a great video in the iCookbook). 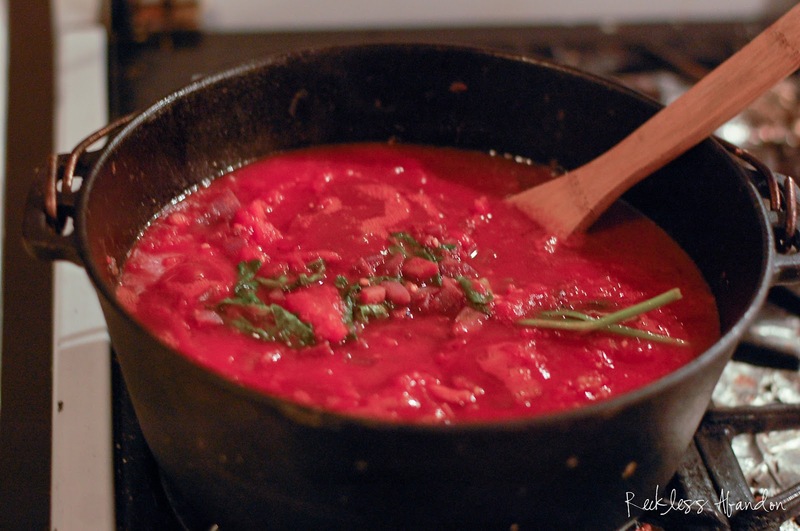 In a large, thick bottomed sauce pot (like my cast iron dutch oven), warm the 1 cup olive oil over a low flame. Toss in the garlic cloves and slowly toast over low heat until the garlic is light brown and softened. 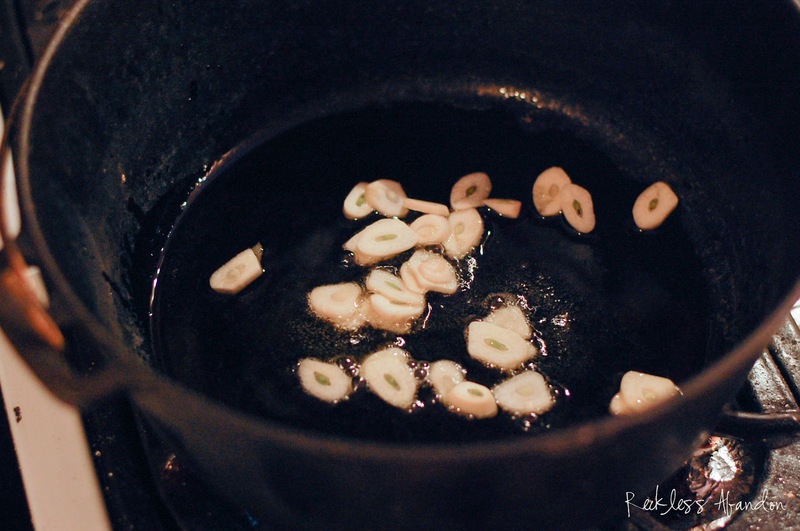 Remove the garlic with a slotted spoon and reserve for another use. 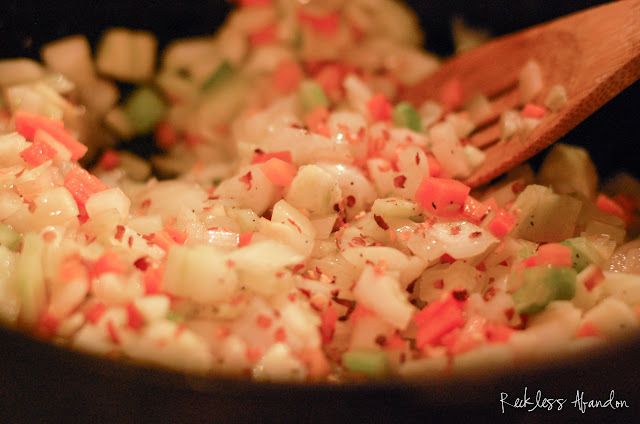 Add diced vegetables to the oil, season lightly with salt, peper and chili flakes. Saute over medium heat until translucent. 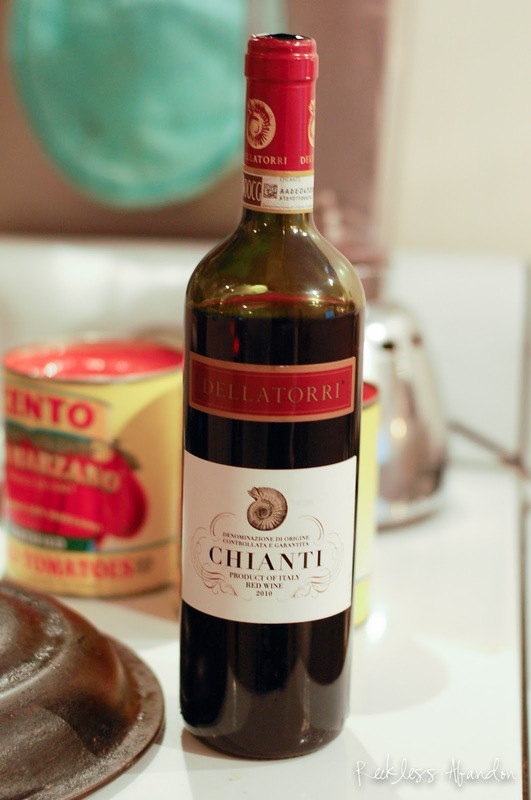 Pour the bottle of chianti over the vegetables until they are covered (I think I used nearly the whole bottle). 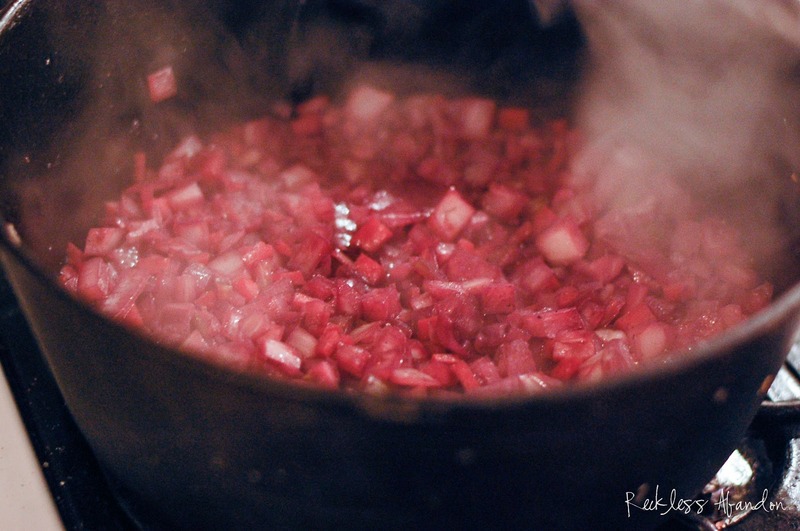 Continue cooking until the liquid is reduced by half. 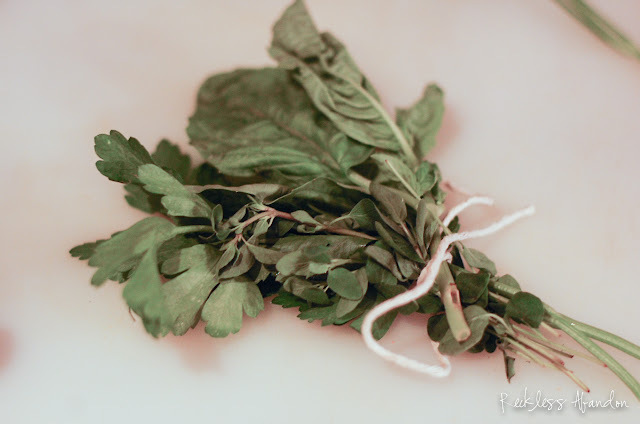 Tie the herb springs together with butcher's twine and stir into the pot. 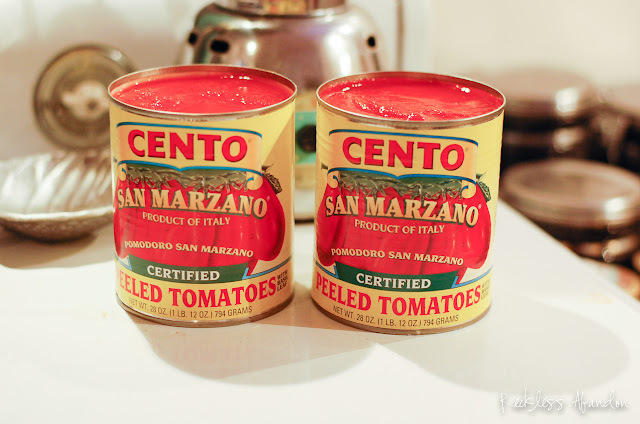 Crush the San Marzano tomatoes (2 cans) with between your fingers and add to the pot. Stir to incorporate all ingredients and bring to a slow simmer. 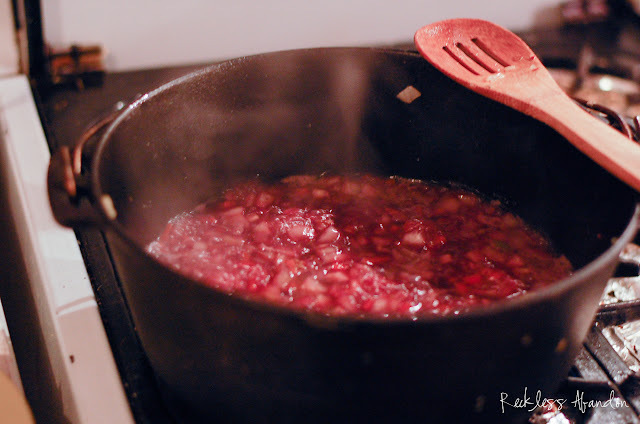 Gently cook the sauce over low heat for at least 2 hours, stirring occasionally. Salt and pepper to taste. 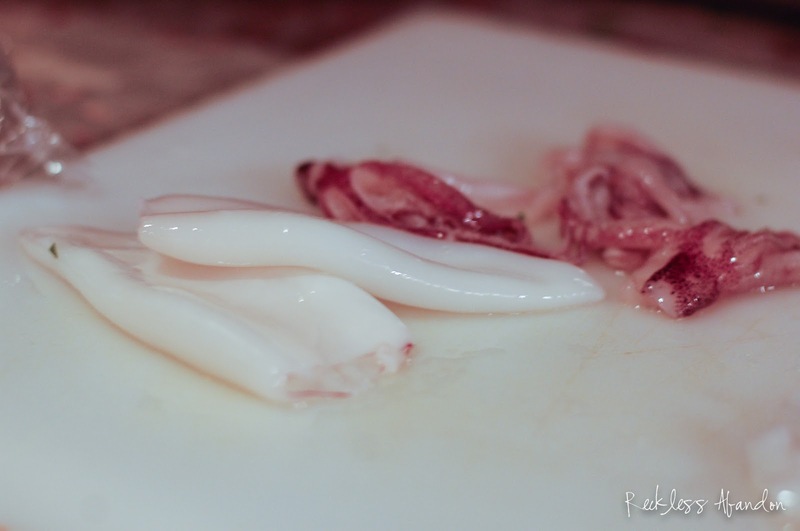 Time to make the Sicilian Calamari. First, slice your calamari into 1/4 inch rings. 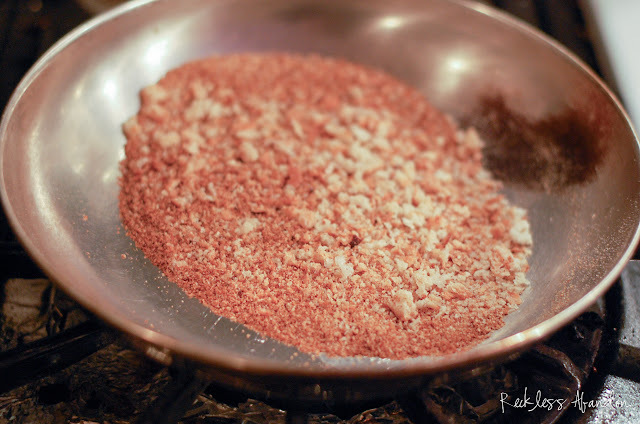 Now is also a good time to toast your 1/2 cup bread crumbs over medium heat in a skillet. 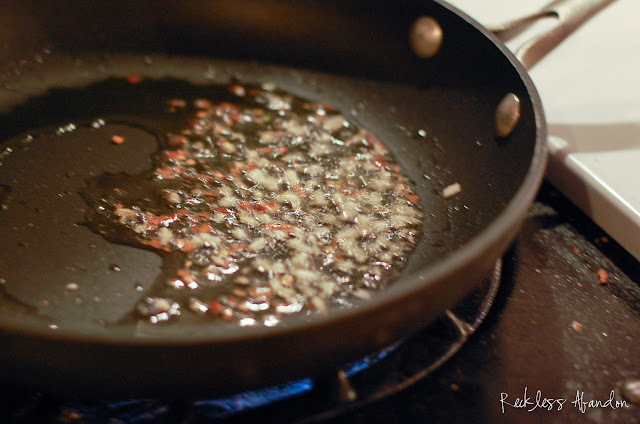 Heat 3 Tablespoons olive oil in a saute pan over high flame. Add 2 cloves minced garlic, chili flakes, and 1/2 tsp pepper to the oil and cook for 30 seconds. 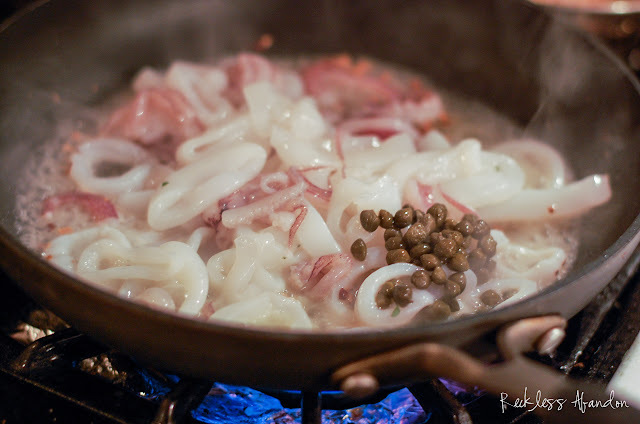 Add calamari, 3 Tbsp capers and 1/2 cup white wine and cook for 30 seconds. 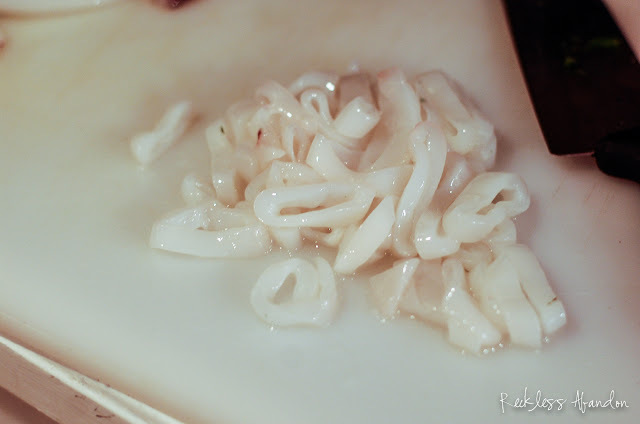 You do not want to over-cook calamari...it will turn rubbery. Ladle in the 1 cup Mother Sauce (or other good marinara) and 1/4 cup chopped parsley. 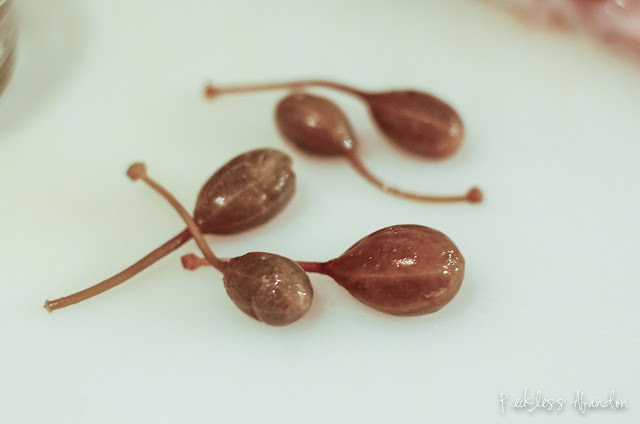 Bring to a boil, remove from heat and then stir in 2 Tbsp butter. Spoon the calamari in a large bowl and top with bread crumbs, caper berries and drizzle of olive oil. I would recommend serving with crusty bread to scoop up the extra sauce. Frank has an amazing how-to video to accompany this recipe in the Luca D'Italia iCookbook, so make sure download it and see for yourself how easy his recipe is!